January 13th 2016: another sunny yet chilly day in Venice. A very typical morning greets our bloggers at the start of their second day in Venice for our blog tour A Taste of Venice. 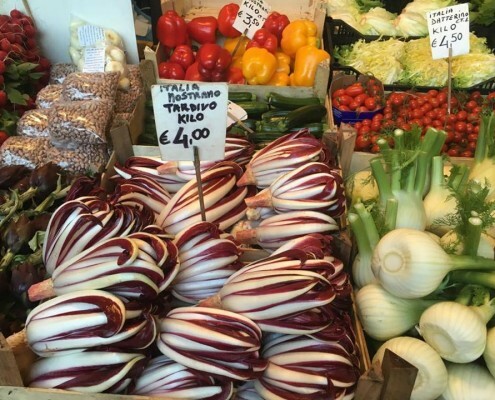 Today is a day of cooking in Venice, of preparing and tasting authentic Venetian food, of meeting and getting to know local artisans – it is a full on day, packed with lots of activities and events! It’s an early cold start – Arianna from Cook In Venice and I (the second half of the company) are meeting with our 10 bloggers at Rialto Market, where we will take a walk around and select all the ingredients we will need to use for our Venetian cooking class later in the morning. Liliana, a very good friend of ours, is meeting us there and she will assist us all during the class. The girls turn up all looking a bit tired and with puffy eyes (the first signs of a fully packed blog tour are already showing up) but they are all so excited to go around the market: it is still pretty early so there aren’t any real crowds. 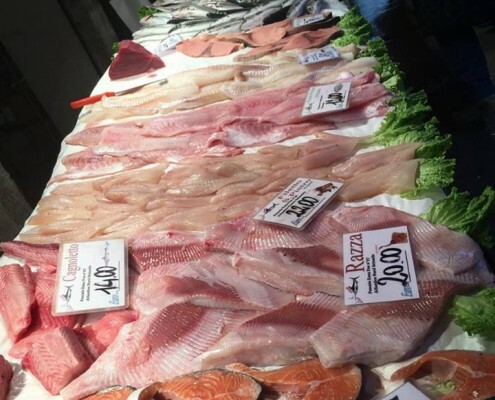 They have plenty of space and time to take tons of amazing photos of the large variety of fresh fish and the locally produced fruits and vegetables! For the food bloggers of the group this is heaven on earth! We pick up our products from our local and trusty fishmonger: two slabs of salt cod for our Baccalà Mantecato and quite a lot of cuttlefish for our Seppie in Umido. 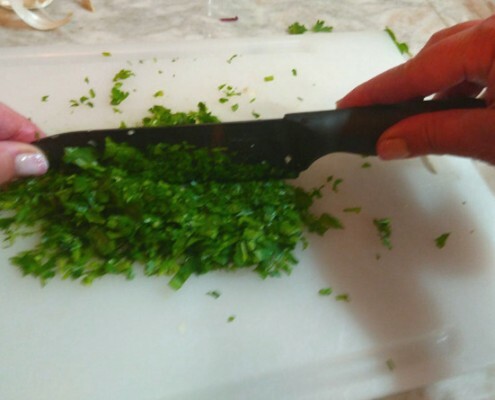 We then move on to the vegetable section and pick all the ingredients needed for our risotto and our side dish of gratin potatoes. Having to drag the girls away from the stalls, we head to our local baker and purchase some fresh bread, which will be the base for our baccalà mantecato. 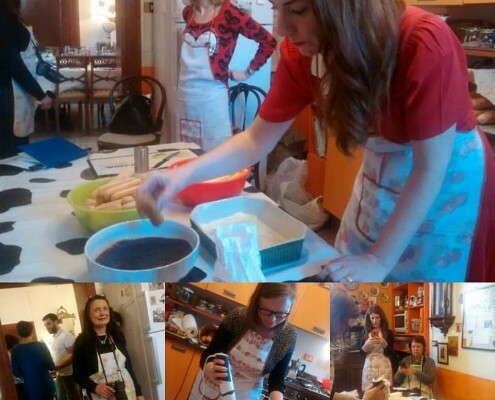 Then we head off to the location of our Venetian cooking class: Palazzo Minotto, a stunning 15th century palace in Dorsoduro, where we will be able to use the kitchen and all of the beautiful living quarters of the apartment where the cooking classes take place. We have to thank Gabriella Pianizzola and her charming apartment in Venice for this! After a short walk through the enchanting little alleyways of Venice, trying not to loose any of our bloggers through the maze of canals and hidden corners, we finally arrive at Palazzo Minotto, where we will be joined by Francesco of Vivo Venetia. 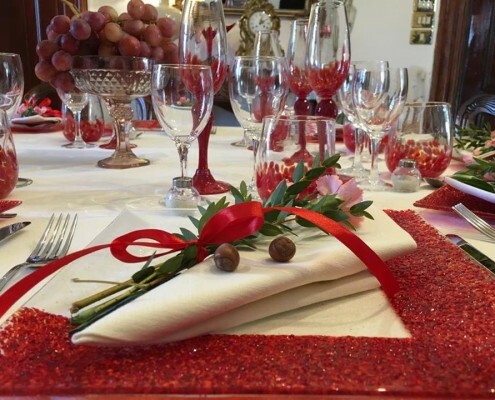 Here we are greeted by one of the most spectacular site ever: Gabriella has expertly decorated the dining room and enormous table with the most exquisite taste – it is a flash of wonderful vivid colors. 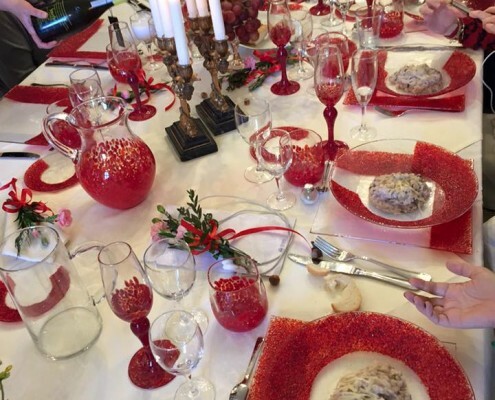 The red and crystal rays of the Murano Glass blown tableware by Abate Zanetti, one of our sponsors, the crispy white tablecloths and the fresh fruit basket: I am taken back by the gloirous beauty. I asked Gabriella to set the table for all of the people taking part in the cooking class and also for the sponsors, but I did not realize she would so such a great job! 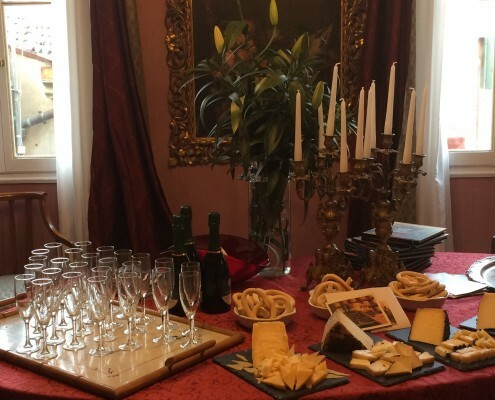 Usually as Cook in Venice, on the arrival of our guests and before the beginning of our cooking in Venice, we like to treat our students to a welcome aperitif, usually made out of cheeses, cold cuts, cicchetti and lots of sparking wine. 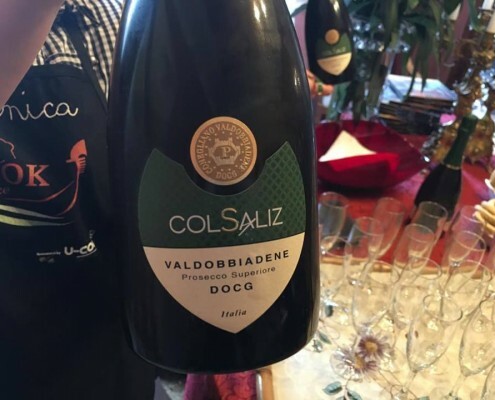 Today we decided to treat our bloggers to something special: we engaged the help of award winning Veneto Prosecco producers Prosecco ColSaliz and of award winning Veneto cheese makers Latteria Perenzin. 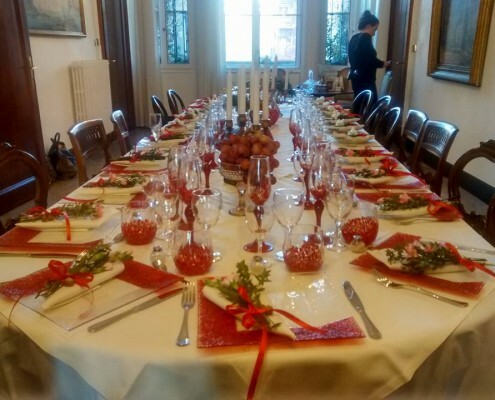 We ask Laura Faganello, founder, with her brother, of Prosecco Colsaliz to introduce us to the wines which we will be drinking for our aperitif, during the cooking lessons and also during all the lunch which will follow the class. Laura very kindly (and a bit emotionally) explains that her wines are produced in Refrontolo, a small little town placed in a lookout hill in front of the area of the Piave River and the Montello area, in a central position to the hills of the Prosecco di Conegliano-Valdobbiadene. She comes from a long tradition of wine and spirits making and she has been running the Colsaliz vineyards for many years now. The company has won many awards at Vinitaly with their different types of Proseccos. But Laura is not really a talking person, but more like a do person, so without further ado she expertly uncorks a bottle of Prosecco di Valdobiaddene DOCG Spumante Extra Dry, to the delight of all present. And while we sip on our delicious bubbles, I introduce Emanuela Perenzin and her daughter Erika of Latteria Perenzin, who very kindly give us an in-depth explanation of all the cheese which we are about to taste. Emanuela proudly introduce us to her large selection of drunken cheese: Bufala with Glera, Formaggio Ciock with Mosto d’Uva, Capra with Traminer and San Pietro in Cera D’api. Drunken cheeses are a particular typical cheese from Veneto: to drunk the cheese is a particular treatment that seems to have been discovered accidentally during the Great War, when the farmers of the areas of Conegliano and Oderzo, hid the cheese with the grape skins to avoid the Austrian soldiers finding them. This method impermeabilizes the rind, conferring a unique flavour to the cheese. 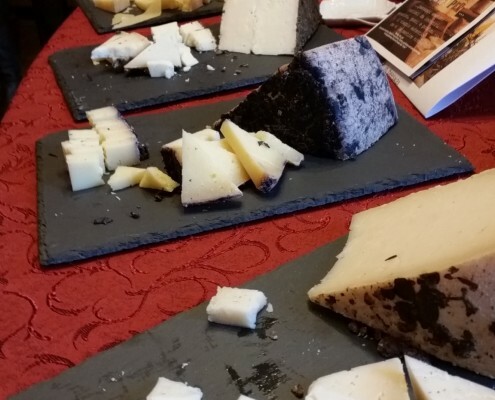 This amazing cheese making company has been collecting awards globally for the last few years and after a sample of their cheese, the bloggers know exactly why! But now we have to get cooking otherwise we will never be able to have lunch! 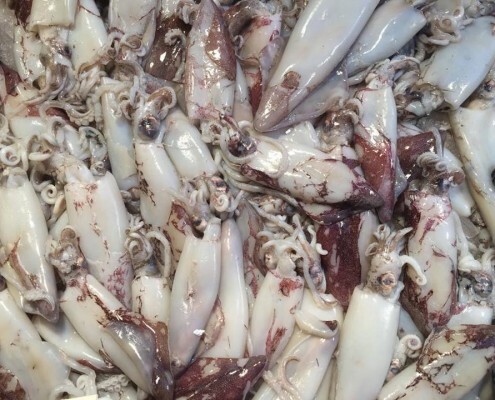 For the full recount of a morning of food preparing (involving some very particular cuttlefish) cooking, eating, drinking, laughing and photo shooting just read the article by Cook in Venice! Running very late on our schedule we finally managed to sit all down to taste the pantagruelian banquet we managed to cook up with the help of our bloggers. 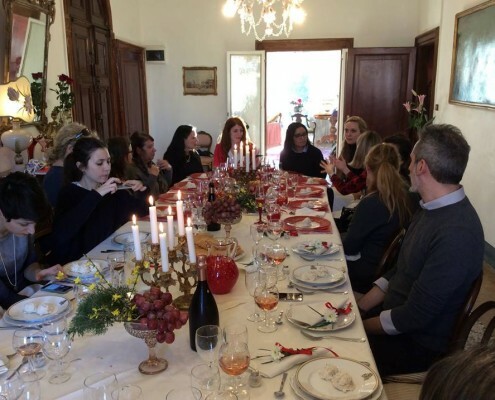 We are joined at the table by Gabriella, Laura, Emanuela and Erika, as well as our sponsors for the day, Davide and Valentina for Abate Zanetti and Marco Priori for U-Cook Italia, which provided all the knives and utensils for our cooking class in Venice. As soon as we sit down we are joined also by Marisa Convento of Venetian Dreams, Marco Jovon and his mum Gabriella of Gioielleria Eredi Jovon, Johann DePietri and his wife Anna of Jam Web – all of this amazing people will each give us an hour lecture on their companies, explaining what they do in Venice. 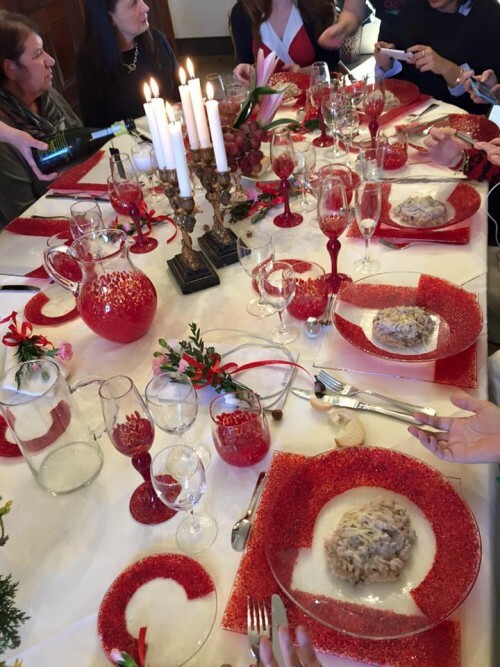 But for the moment we all sit down to enjoy the dishes we have cooked all together, presented on the stunning plates by Abate Zanetti, drinking waves of Prosecco and Rosè by Colsaliz. I stopped counting the bottles at 10!!! To see all of this people, bloggers and sponsors, all sitting together, having a great time, talking about Venice and how to help promote a new form of tourism, one which can preserve and help the city, is a dream come true for me. 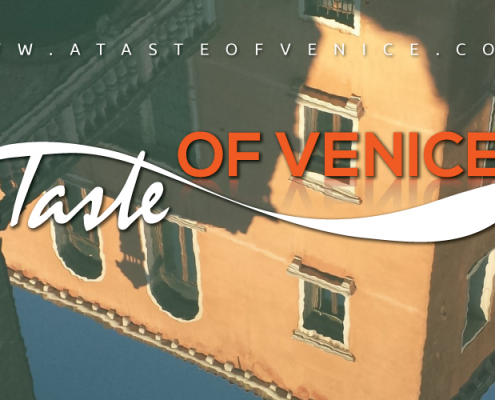 This is the fulcrum of A Taste of Venice blog tour, a moment which I will treasure for the rest of my life – even though Arianna, Liliana and I were so busy cooking and dishing out that we did not manage to sit down with all of them! After lunch it is time for our sponsors to introduce themselves, so whilst Liliana and Arianna wash the dishes by hand (the only fault of a beautifully glass blown dish is that you have to hand wash it, so you can only imagine having to clean a full set of plates and glasses for a table of 25! ), I organize for the bloggers and the sponsors to relocate to the stylish living room of Palazzo Minotto, where for the next 3 hours the bloggers will be able to learn about ceramic Italian designed knives, Venetian hand carved cameos, Venetian Murano glass beads and how to optimize their websites for maximum traffic! 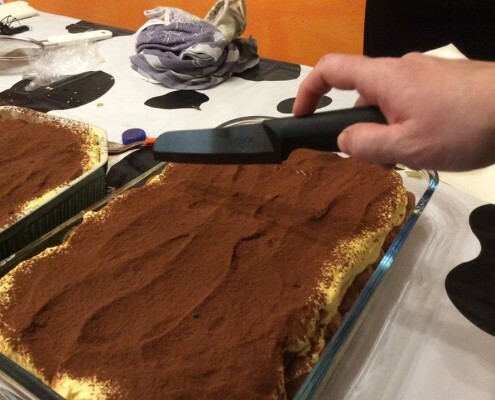 In between I treat them to our Tiramisù with Ricotta mascarponata and some fresh coffee, whilst gifting them with the most wonderful present: the world famous book of photos of Venice “Dream of Venice” by Charles Christopher and JoAnn Locktov. And when the girls thought the day was coming to an end, I quickly call them to action and off we go, not forgetting to first thank Gabriella for her wonderful hospitality and for putting at our disposal her beautiful home. 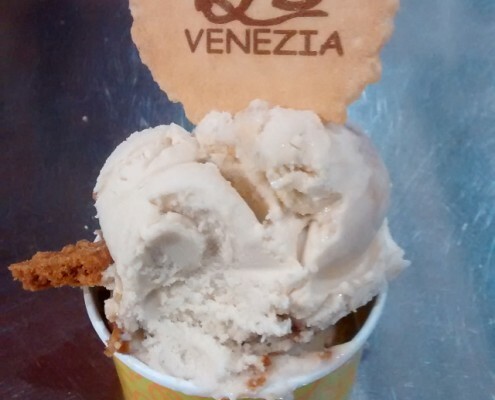 Our destination is not far from Palazzo Minotto – we are off to Quanto Basta, a local ice cream parlour and take away shop in Lista di Spagna. Here Marta Semenzato, together with her family, runs this Venetian artisan gelateria and here it is where she will explain us, for the next hour, how ice cream was born, how it is produced and what makes their ice cream special. We also get to taste some too and we get a sneak peak to their large selection of frittelle too, since unofficially here in Venice is already Carnival time. Once Marta has finished her very interesting talk, we set off again, this time towards Rialto, to be more precise to Calle Delle Acque, where we are going to visit Sogno Veneziano Atelier, a local shop owned by Giulia and Igor, who design and create hand stitched Carnival costumes and masks. Once we step through the little door of the atelier, our bloggers are left breathless. 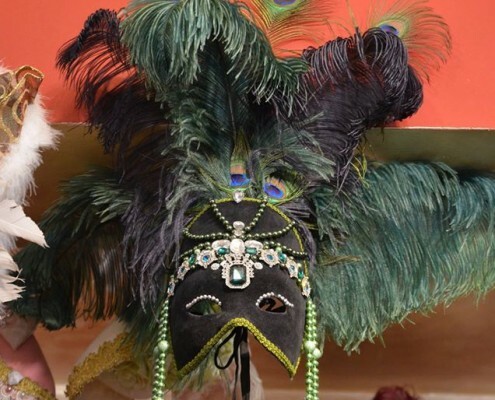 the shop is jam packed with incredibly decorated Carnival costumes, of all shapes, styles and sizes, both for men and women alike. Giulia even designs and creates costumes for small dogs, unique! Giulia explains that she chose the name of her shop meaning Venetian Dream, because everyone has the right to live a dream once in a life time and not necessarily only at Carnival time. And Igor adds that their costumes are designed to be desirable, to make women feel wanted and glamorous. As well as creating their costumes and masks, Giulia and Igor organize also photobooks and wedding proposals and since they are good singers, I am pretty sure they will be happy to sing for you if you pop in their shop to visit them! So late at night on this cold winter evening in Venice, I finally say goodbye to my dear friend bloggers and set off already thinking of tomorrow’s events, another day packed full of unusual activities in Venice. Tomorrow is a day dedicated to glass, Murano glass like you have neve seen it before! Remember all of the activities which our bloggers have taken part in can be booked online directly on the site of our partners or on the site of Vivo Venetia. I am a true venetian for many generations and I dont like mass tourism at all and ignorant tourists. I appreciate this reading by A Taste of Venice. It is an intellignet way to make a living but also a wonderful experience for their guests. I would like to know if you thought to make a day in Venice about chocolate..? We have a famous tradition of it…thanks for the delightful story. thank you so much for your nice words – I am glad that a true Venetian (I am too, like most of the people who are involved in this project/event) appreciate our effort to change the way people look and visit Venice. We believe that is only with education and by raising awareness that people can change – so our aim is to talk as much as we can and as best as we can about Venice and its people. With regards to chocolate, thank you so much for pointing it out – and yes, we are aware of the strong connection which Venice has with Chocolate and with sugar. Vizio Virtù organises already history talks and tasting in their shop and Cook in Venice organises a Cake & Choc tour introducing visitors to the real cakes,desserts and chocolates of Venice. Only the best patisseries and chocolatiers! We would like again to thank you for your support and help us spread the word for a more responsible way of visiting the city which we all love so dearly!